The seven-year-old, owned by airline boss Michael O'Leary, has booked himself a likely place in March's Cheltenham Gold Cup with Sunday's win. Gold Cup winners Lord Windermere and Bobs Worth filled the last two positions in the nine-runner race. Cooper was hard at work some way from home on Road To Riches, but was still in with a shout at the last where On His Own and Sam Winner were battling it out. 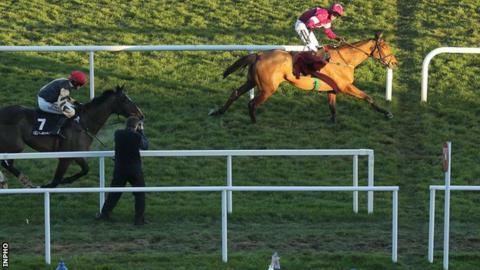 And he produced a strong finish to win by one-and-a-half lengths.